Bobby Brown's release after three nights in the county jail was the result of a radio station paying the $19,150 the R&B singer owed in late child-support payments and court fees, the station said Thursday. Hot 99.5 FM, which broadcasts in the Washington D.C. area, intervened following on-air discussions and two days of negotiation with Brown's attorney, the host of the station's "The Kane Show," told The Associated Press. "In exchange for the money, he agreed to be an employee of our radio station for one week," where he will discuss what he did wrong and how he could turn his life around, said Kane, who goes by one name. "We are going to have a very open and candid conversation." Brown was released at 7:45 p.m. Wednesday. A judge had ordered Brown held in the Norfolk County jail in Dedham until he paid after constables arrested the singer while he was watching his daughter's cheerleading competition at a local high school. Brown will travel to Washington D.C. and be on the air with Kane for the morning show beginning Monday. He also will make public appearances for the radio station. "Once Friday rolls around, he's done and released — and he's on his own," Kane said. Phaedra Parks, Brown's attorney in Atlanta where the singer lives, did not immediately return a phone call by The AP. Parks had earlier said the singer has been struggling to meet monthly payments to Kim Ward, of Stoughton, the mother of his two teenage children. Brown and pop diva Whitney Houston are divorcing after 14 years. "Although this agreement was put in place when he was Bobby Brown the star, this agreement is being enforced when he is not always able to find work," Parks said earlier this week. "He hasn't made an album in quite some years." Brown, a Boston native best known for a solo hit "Don't Be Cruel," has a history of legal troubles. 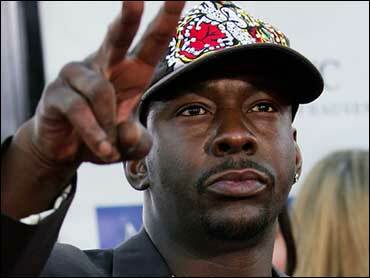 In June 2004 he was sentenced to 90 days in prison for missing three months of payments. That sentence was immediately suspended after Brown paid about $15,000. Last March, Brown was nabbed for minor motor vehicle violations dating back 14 years when he arrived to watch his daughter at another cheering competition. Brown was cooperative and allowed to drive to the police station after the competition, police said. In October, Brown paid $11,000 in delinquent child support after being threatened with arrest if he stepped back into Massachusetts. He owed more than two months' worth of payments to Ward.